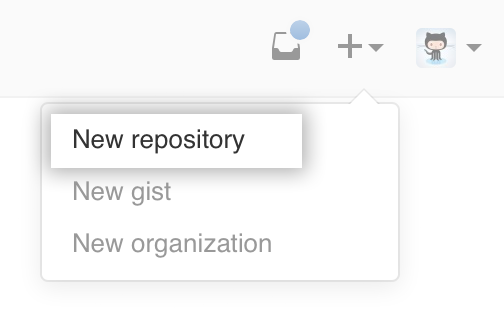 Tip: Owners can restrict repository creation permissions in an organization. For more information, see "Restricting repository creation in your organization." In the Owner drop-down, select the account you wish to create the repository on. Type a name for your repository, and an optional description. You can choose to make the repository either public or private. If your instance is not in private mode or behind a firewall, public repositories are visible to the public, while private repositories are only accessible to you and people you share them with. For more information, see "Enabling private mode" or contact your site administrator. There are a number of optional items you can pre-populate your repository with. If you're importing an existing repository to GitHub Enterprise, don't choose any of these options, as you may introduce a merge conflict. You can choose to add new files using the command line later. For more information, see "Importing a Git repository using the command line," "Adding a file to a repository using the command line," and "Addressing merge conflicts." You can create a README, which is a document describing your project. For more information, see "About READMEs." You can create a .gitignore file, which is a set of ignore rules. For more information, see "Ignoring files." When you're finished, click Create repository. "Managing access to your organization's repositories"